Sac'to? Is that what the kids call it? The elf spins between two of the wererats, intercepting one of the lycanthrope's attacks with his own blade; the sound of sword against sword grating against the teeth. Ending the movement with a flash of green-bladed steel, the smaller wererat has no hope of parrying Kellindil's weapon. He buries it deep in the creature's chest before he disappears around the corner, leaving the beast to collapse to the floor in front of its comrade. Quan takes a deep breath and lets out a belch at the nearby ratman. It squints at the noxious vapor and the monk trips him into the Otyug. Its Longsword stabs the creature with poison just as Quan topples the wererat into the sewer. OOC: AP: Drunken Monkey vs WSG2, hits, makes MBA vs OT. Last edited by johnmeier1; Friday, 1st July, 2011 at 07:49 PM. I assume you meant wererat sewer guard 1. The remaining wererats all seem to wince and shake a little bit as their lycanthropic disease start to speed their healing unnaturally (wererats regenerate 5 hit points, wererat sewer guards regenerate 10 hit points, minion 0). The wererat sewer rat fighting Quan, doesn’t heal this turn. The wererat is slid into the sewer by the dwarf warlock and comes up sputtering, but not hindered in any way by the filth. It shuffles over, across the sewer from the dwarven pair and climbs out of the trench. 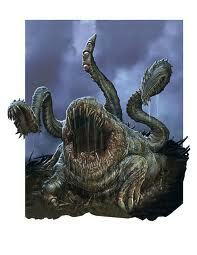 It reaches into its tunic and pulls out a vial, grips the stopper with its teeth and prepares to drink it. Wererat 1 (J18): Move: stand; Standard>Move: K16>J18 (Athletics Check (DC 10): ROLL; Minor: grab (mysterious) potion. Wererat: 55/55 hp; AC 19, Fort 17, Ref 19, Will 14; MBA: Short Sword +10 vs. AC; 1d6+4 damage; RBA: Dagger: +9 vs. AC; 1d4+4; Regeneration 5 (if it takes damage from a silver weapon, its regeneration doesn’t function on its next turn); Bite: +9 vs. AC; 1d4+2 damage and the target contracts Filth Fever. Combat Advantage: the wererat deals an extra 1d6 damage on melee attacks against creatures it has CA against. Wererat Sewer Guard: 71/71 hp; AC 20, FORT 18, REF 20, WILL 16; MBA: Longsword +11 vs. AC; 1d8+4 damage, plus ongoing 5 poison damage (save ends); Regeneration 10 (if it takes damage from a silver weapon, its regeneration doesn’t function on its next turn); Bite: +11 vs. AC; 1d4+2 damage and the target contracts Filth Fever. Dance of Poison: The wererat guard makes two longsword attacks, shifts up to 4 squares, the makes two more longsword attacks (Recharges when Bloodied); Combat Advantage: the wererat deals an extra 1d6 damage on melee attacks against creatures it has CA against. Stage 3: target takes an additional -2 penalty to AC, Fortitude, and Reflex and loses all healing surges and cannot regain hit points. Kellindil steps around the corner and lets fly from his crossbow. The bolt slams into the wererat's shoulder, causing a great deal of damage. The monster remains on it's feet however, swaying from loss of blood. Stepping past Muzdum, he says blandly, "Help the others; I'll take care of that one." Quan winces at his injuries and coughs up blood. He grins though and follows Orsik in closer to the giant underdweller. Spinning around he kicks out three times. Two connect and he uses the momentum for the third. Suddenly he falls into a swarm of flies. 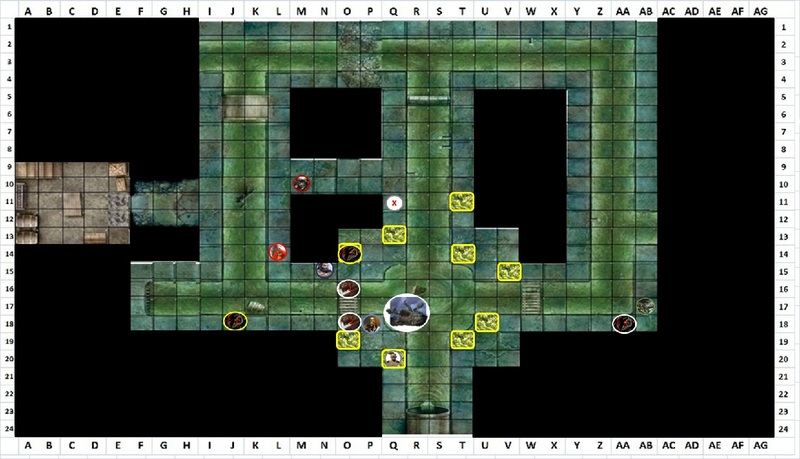 OOC: DM: Map doesn't seem to jive with Combatants notes. Want to hit wererat 1 and Otyugh for sure. Free: centered flurry on Wererat Sewer Guard 1 6 damage, slide to sewer (save) Do they take fall damage? Last edited by johnmeier1; Saturday, 2nd July, 2011 at 02:00 AM. GM: @johnmeier1 : Are you saying the GM made a mistake? lol Wererat Guard 1 is at O16 not Q16. So your attack and flurry of blows misses WSG1. Do you want to apply the flurry damage to otyugh or WSG2? Last edited by jsb420; Saturday, 2nd July, 2011 at 02:24 AM. Also johnmeier1, it looks like you can get to P-17 and hit all three if you want. If you have to just move (and not shift), the Otyugh is dazed so doesn't get OA. And WSG1 has vulnerable 2 to all damage. Rikka stepped away from the wererat, then ran back into the darkness of the tunnel. OOC: Assuming the Quan moved before Orsik last round, Orsik would shift to P19 before calling on Stone's Endurance, thus granting Quan resist 5 TENT, if not, he does it now. Orsik draws golden rune which flies quickly and stops in front of Muzdum, spinning lazily. "Muzdum, can you borrow some of your toughness? Pierce the rune you see and it will armor you, Braddock and me and heal us." As dwarven warrior touches it, it flies appart, runes of protection dropping on his armor and pieces flying over to besieged warlock and back to Orsik. With it comes relief and strength to continue. Orsik almost casually shrugs off constricting tentacle and turns Osvetnik down and jabs at the ground. From the impact point golden light spreads out enveloping two guards and the otyugh. Last edited by MetaVoid; Saturday, 2nd July, 2011 at 07:47 PM.